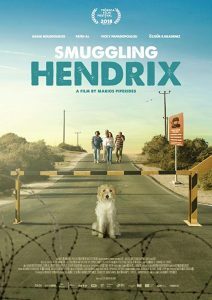 “Smuggling Hendrix” (2018). Cast: Adam Bousdoukos, Fatih Al, Vicky Papadopoulou, Özgur Karadeniz, Georgia Constantinou, Toni Dimitriou, Marios Stylianou, Andreas Phylactou, Charlambos Charlambou, Pepper. Director: Marios Piperides. Screenplay: Marios Piperides. Web site. Trailer. To call this situation a comedy of errors would be an understatement. But, at the same time, it also draws attention to a number of more serious matters worthy of profound consideration, particularly the underlying beliefs that brought them into being. As products of the conscious creation process, the philosophy that maintains we manifest the reality we experience through the power of our thoughts, beliefs and intents, these issues ultimately arise from us, making us the ones responsible for their materialization and inherent qualities, including any alterations that are deemed necessary to make them more to our liking. Most notably this is true where the island’s political situation is concerned. Cyprus is a divided nation, one saddled with self-imposed borders that keep its inhabitants apart from one another, each faction believing it has a right to its lands, rights of self-governance and so forth. Such a separation didn’t arise by osmosis, though; it was created, brought into being by beliefs of those on each side of the barricades. Ironically, though, the Greek and Turkish residents depicted in the film each routinely insist upon the intrinsic brotherhood that binds them, that, in the end, they’re all members of the same human race. At the same time, though, everyone in the story seems to love Jimi. They all seem to be able to agree that affection for a pet transcends the social and political boundaries that separate individuals from one another. So, if everyone can agree on that where an animal is concerned, then why can’t they do the same when it comes to their outlooks toward their fellow man? Jimi helps to unite the humans where he’s concerned, setting an example for them to do the same with one another – provided they avail themselves of it. But, if that’s going to happen, then a belief change is obviously in order, something that may not be as easy to achieve as one might hope. If the parties can’t agree on something as simple as the requirements for bringing a pet across the border, then what hope is there for the feuding factions to come together in peace and harmony? It’s by no means impossible, but the change must begin with the beliefs each side holds. One can only hope Jimi provides them with some inspiration to do so. For a suitable reconciliation to occur, for each faction to truly come together as the brothers they claim to be, they must join forces in an act of co-creation, one driven by commonly held cooperative beliefs. It’s a point the film drives home repeatedly where the Cypriot political situation is concerned, with Jimi serving as the catalyst for attempting to draw his divided human countrymen together. The misadventures they jointly share reveal the petty ridiculousness driving the circumstances that keep them apart, conditions that both separate man from dog and fellow man from fellow man. Indeed, if we’re all one big human family, this niggling estrangement seems pretty silly in the end – and, ironically, it takes man’s best friend to help show us the errors of our ways and the beliefs behind them.